Facebook Ads: Will they Work for You? The first part involves user-initiated recommendations of a brand: When people visit a business' Facebook page, they can choose to share their engagement with the brand (by becoming a "fan" or writing on the brand's "wall"). What this does is establish trust. If your friends or family recommend a brand, chances are you will add that brand to "one of the rungs on the ladder" for your consideration set. The second part is the actual paid-advertising. Facebook will permit advertisers to attach an ad message to those user notifications. To do so, marketers make a Facebook ad buy targeting users by any number of traits users volunteer on their profiles, such as age, political leanings or interests and activities. I think that Zuckerberg is bang on with the notion that a Pull strategy is going to be the way of the future in terms of advertising. So will Facebook Ads work for you? Well that depends on if you are willing to accept the fact that traditional push strategies are a thing of the past. The consumer is in control. This goes against what traditional marketing managers have done in the past. It's always been a push strategy. Push the brand to the potential consumer, push the product to the potentil consumer... it has become so bad that consumers tend to ignore much of the advertising that is presented to them. Thing of television ads. How many of you turn the channel when an ad comes on? How many run to the kitchen to grab a snack? How many people actually tune in and focus on the ad? Even in the online space, our research has shown that certain users still ignore sponsored listings in favor of organic listings. Others simply ignore sposnored ads because they treat them as unwanted advertising. Today, Facebook Ads launched with three parts: a way for businesses to build pages on Facebook to connect with their audiences; an ad system that facilitates the spread of brand messages virally through Facebook Social Ads™; and an interface to gather insights into people’s activity on Facebook that marketers care about. Advanced targeting allowing you to target your audience by age, gender, location, or interests. Trusted referrals as you can attach friend-to-friend interaction about your business to your ads. Content integration allowing the most relevant content to come to the surface. Reach the right audience - Instead of creating an advertisement and hoping that it reaches the right customers, you can create a Facebook Social Ad and target it precisely to the audience you choose. Top of Mind Awareness - Facebook Social Ads allow your businesses to become part of people's daily conversations. Simplicity - Creating a Social Ad for Facebook is quick and easy. Simply write a creative, tell Facebook who you want seeing your ad, and decide where you want to drive traffic. But What About Reputation Management? Opening up advertising to the social masses can be a dangereous thing. You see it keeps business owner's honest. If your product/service is not what users expect it to be, you can bet that you are going to hear about it from users in social media outlets such as Facebook. We've all heard stories of dissatisfied customers who have gone on to blog about a negative experience with a product or brand. The end result that sales of that product plummet leaving the brand to do damage control. Point being is that if you want consumers to promote your brand or your product, you had better make sure that your product satisfies their needs. While the goal with Facebook ads is to promote your brand in a positive light, the social network can also be used to communicate negative experiences with your brand or product. Is that a risk that many companies want to take? Let's not forget that in order for this to work, users need to share their purchase behavior with their friends and family. Not everybody is willing to do this. 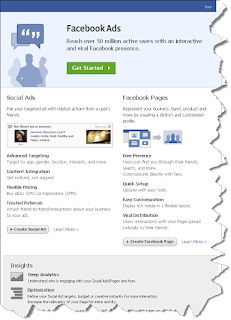 Will Facebook Ads work for you? Well Facebook Ads will work for any advertiser providing you put faith in the social masses to endorse your product and brand. Seth Godin Likes Meatball Sundaes?